The years before the war forced everyone in Shanghai to choose: Nationalists or Communists? Resist the Japanese invaders or collaborate with them? Even passivity became a choice, a gamble, a hand consciously played. As for me, Song Yuhua, my hand was forced — I belonged to Du Yuesheng, and though I served him in public, through my education, rather than in private, as did other women, I was his indentured property, to do with as he pleased until my thirty-third birthday. Only in my secret mind was I free, so it was there, naturally, that I staked everything of my life that mattered. It was 1936; war was coming. Conflict with foreign powers had been eating at China for a century, since the Opium Wars first partitioned port cities such as Shanghai into foreign controlled districts. We had already grown accustomed to being colonized, but then Japan’s southward expansion from its base in Manchuria turned into an all-out invasion. The Japanese ate up more and more of the northeast, and drew dangerously close to Peking, yet still Chiang Kai-shek did not fight them. His Nationalist armies fought only the Communists, who he believed posed the greater threat. When the Imperial Army pushed hard enough, he simply withdrew and conceded terri- tory to Japan. The wrath of heaven and the resentment of men could be felt everywhere. To so many of us, Chiang’s policy, “first internal pacification, then external resistance,” seemed like treason. Ye Shanghai was what everyone called that time and place — Night in Shanghai, after the popular song by Zhou Xuan. 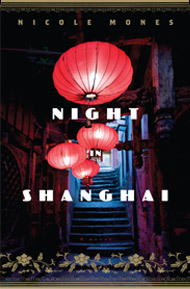 It was a world of pleasure, permission, and nightlife, which was destined to evaporate the moment Shanghai fell to Japan. Jazz was the sun around which this paradise revolved, the rhythm that drove its nights, and agents like my brother Lin Ming made it possible by recruiting jazz men from across the sea and managing their lives in Shanghai. Those were the years of the great black orchestras from America who filled the ballrooms, bringing a marvelous sound that had never been heard in China before. For years after the Americans were gone, people remembered them, especially Thomas Greene. I used to hear people say they’d heard him play, or they’d danced to his orchestra, or they had it on good authority that he had been born in a cotton field. I knew all this was nonsense, and kept quiet, for almost no one really knew him. I did, knew him and loved him, more than this life would ever allow me to love any other. This was the one secret I never gave up. A forest of pops sounded from the south, over the rooftops. Later he would learn it was Japanese soldiers at firing drills on the proving ground below the Hangzhou-Shanghai railhead, but on that first morning, since Lin Ming had told him all about the Japanese invading China, he thought for a chaotic and dreamlike moment that the time had come. But then it grew quiet again, and he saw the night soil man continuing up the lane unhurried, and the women still opening and closing their doors. No war today. Just his first rehearsal at nine o’clock, when within eight bars, the rest of the orchestra would know he was a fraud. But finally, luck got him work sight-reading the classics at a rich man’s party in Guilford, and word of mouth got him some more. He did not land many jobs, just enough to give his mother a respectable sum toward their rent and food. He should have been happy with that, times being so hard, yet he was always on eggshells because some of these engagements came his way on account of the fact that his looks were light enough to confuse people. He may have been caramel-toned, with eyes as dark as ink, but his features were finedrawn enough to attract second looks on the street. If he shaved his hair close, he had people asking his nationality. It didn’t hurt that he was a classical player, whom everyone expected to be vaguely foreign, possibly European, though surely from one of the southern countries. When asked his background, he always weighed his answer, since as colored, he got two dollars, but it was five when he performed as a Turk, or a Portuguese — which he did, whenever he thought he could get away with it. He cracked the wooden wardrobe painted with Chinese scenes to find his meager stack of folded clothes, which seemed to have been arranged on the shelf yesterday before he even made it up the stairs. At home he had been proud of these suits, no, depended on them; they were his badge, the uniform that showed him to be a man of gentle education, fluent in the music of Europe. He had spent his whole life mastering the role, and now — he was here. He knotted his tie and buttoned his threadbare jacket like he was going to a funeral. In a way, he was. Downstairs, he came upon the servants eating at a round table in the kitchen, but they waved him insistently into the dining room, where he found a table set for one, with china on white damask, all because he was the bandleader. Chen Ma bustled in to serve him some of the rice gruel they were eating in the kitchen along with buttered bread and enough eggs for six men. Hunger overwhelmed him, and when he had satisfied himself and started to slow down, Uncle Hua came in from the kitchen to stand over him. “Master clothes b’long low class,” Hua sniffed. “No kidding.” Thomas lifted a shoulder in response, and went on eating with real silver that felt heavy as liquid in his hand. He had seen silverware, of course he had, in rich houses where he had played at parties, but this was the first time he had eaten with it. His mother would be proud; she had made their little place an island of manners and gentility, with her fringed lampshades and her handmade antimacassars, and the exquisite sonatas that trilled out from her parlor every evening. She played the organ and taught piano at the church, and between the two of them, they made do, at least until she got sick. It came on quickly, but word got out and her friends came to visit, all dressed in their best hats and gloves as she would have been. Even his cousins from his grandfather’s side in Easton, across the Chesapeake, came to see her. Thomas had not seen them in years, not since he last traveled as a boy to their small patch of land, hand-cleared out of the dense, mosquito-whining woods, to stay in their brick house with two rooms downstairs and two up. It was jarring to see them full grown now, as he was, and he shook their hands and embraced them and let them all have a few minutes in the bedroom with her to reminisce about the summers when he and his mother rode the colored bus all the way up to Delaware and then back down the Eastern Shore to see them. He had built forts in the woods while she made pies in the morning, before the day grew hot, after which she passed the afternoons on the screened porch with her mother, who had been her own childhood teacher, just as she had been his. Now the years had passed under the bridge like slow water, the Great War come and gone, the ’twenties too, and he and his cousins were full grown, and his mother lay dying. Thomas was in the small kitchen heating up the meals the women had brought so he could put them out on the table by the stack of plates. The living room was full of church ladies, trading stories and gossip, passing in and out of the bedroom and telling each other, She looks more at ease, yes, there’s less pain today. I’m certain of it. Let’s let her sleep. Then they descended on him like a warm, powdered, halfsour old flock of birds, hugging him and blessing him and saying they would be back to see his mama on the morrow. A nd then he was alone with her. He finished the dishes, let the sadness drain through him as he emptied the sink. Though he had been born in these rooms and lived here all his life and knew every floorboard and wallpaper seam, it was over. If she died, he would have to move. Where? A boardinghouse? Out west? People said there was work in Seattle. He paused. Should he let her sleep? His eyes adjusted to the low light and he saw she was so rested, she looked like she had sunk right down into the bed. “Mama?” he said once more. He laid a hand on her arm and jumped back as if he had touched a hot stove. Cool. He touched her again, slowly this time, everything breaking inside him. He’ll come to your house, he won’t stay long. “Master?” said Hua, standing impatiently over him. “Breakfast?” Thomas indicated platters, half-demolished. “Well.” No more postponing it. He shrugged on his worn light-brown wool, inadequate for the cold and clearly a rag next to Alonzo’s fine topcoat, and picked up the briefcase he took everywhere. Alonzo nodded. “Well — the first members were some guys who played with Bennie Moten’s gang at the Reno Club in Kansas City. But then last year Bennie died having his tonsils out, and Bill Basie took over — you’ve heard of him, people call him the Count because he carries this card around that says ‘Beware, the Count is here.’ You know the Count?” They had come to the end of the lane and Alonzo raised his hand for a conveyance. “Seattle,” said Thomas. That made it sound simple; it had been anything but. By the time he made it to that mist-shrouded city, he was broke and starving, and when the Blue Rose on Yesler Way offered him janitorial work, he did everything but fall to his knees in gratitude. The jazz club opened every night in the basement, and he cleaned it daily in exchange for meals and a small room at the back. In the afternoons, his work done, he returned to the now pristine basement and its baby grand. 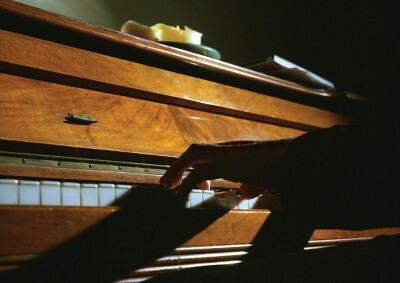 In those last hours before sunset, when weak light slanted in through the dust motes in the air, his piano playing would make the owner, Big Lewis Richardson, along with anyone else who happened to be in the house, stop what they were doing and drift down the stairs to listen. He understood that they were not used to hearing this kind of music in the house, read from the page, at this level of difficulty. “It’s a commitment,” his mother used to say, with a hush, as if art stood above all else. But what had this commitment brought him? Two dollars a night if he was a colored man, five if he was not. But when it came to jazz, she need not have feared, since he could not play it. He had heard it sure enough, wailing underground in clubs and speakeasies, all through Prohibition, hot, polyphonic, toetapping, full of syncopated rhythms and bent, naughty notes — perfect for small and secret spaces. Now that alcohol was legal again, the music was changing, along with the very character of the night itself. Swanky clubs and ballrooms opened, featuring larger, dancehall- type orchestras. With so many more instruments, especially on top in the reeds and the brass, songs had to be tightly arranged, by skilled bandleaders. This meant work, and it was considerably closer to Thomas’s own playing than the exuberant Dixie-style polyphony of the ’twenties had been — but still out of reach. This was clear to him after he heard the top bandleaders like Henderson and Ellington, who played whole orchestras like instruments. Thomas could play, but they were titans, and there was never a moment when he did not know the difference. “That’s the problem,” said Thomas. “What you need is to learn the standards, with a little swing.” Big Lewis launched into singing “About a Quarter to Nine,” a popular song from the film 42nd Street. “Go on!” He waved toward the keys. “Yes. If it’s written, I can play it. Let me get the music for that one and look at it.” So Big Lewis advanced him five cents, and Thomas went down to Jackson Street for the sheet music, came back, and read it through. When he did, it was so simple he was embarrassed. In playing it for Big Lewis, he did his best to embellish it so it would sound more presentable. “No! You turned the beat around again. Where are you, in church?” Big Lewis gave a slam to the nearest tabletop and scuffed off. Each night Thomas listened closely to the jazz in the basement, especially the piano work of Julian Henson, which was tightly controlled even when he improvised. There was restraint to it, a kind of glassy hardness. If I could play jazz, I would play like this fellow. But when he tried it at the piano the next day, it still eluded him. Big Lewis heard. “You’re trying too hard. It’s variations on a song. Think of it like that, a song.” He showed Thomas how to use the blues scale to force what he called the worried notes, especially the flatted third and seventh, over a major chord progression. When Thomas could not hear how to layer these up with counter-rhythms, or how to build chords from dissonant intervals, the older man sang him through it and showed him, using his voice, how to dance around his improvisations and get off them as quick as a grace note. By the end of that week Thomas could play at least a few of the popular ballroom numbers, like “Body and Soul” and “I Can’t Get Started,” and his renditions sounded respectable, if not exactly right. “Will I get by?” he asked Big Lewis. So Thomas threw himself into practicing dance numbers every afternoon, and though he got better, he knew he was still well shy of the mark when Big Lewis pulled him aside one night at closing time and told him there was an agent in the house, a man from China, who needed a piano player. Thomas stared. Shanghai! It was alluring, dangerous; there were songs about it. “Is that him?” he said of the tall, rangy fellow who was the only Asian man left in the place now that it had emptied out. He had a narrow face, doorknob cheekbones jutting beneath his long, dark eyes. Thomas noticed his hair was combed straight back and pomaded down, while his suit still showed creases from the steamer trunk. He dressed like a gentleman, which struck Thomas as a promising chord of commonality. “Go talk to him,” Big Lewis said. He looked down at his overalls. Maybe it was a good thing, a lucky thing, the way he was dressed. “Play what?” he said nervously.